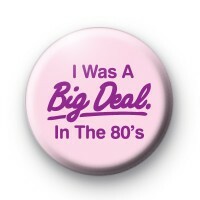 This light pink 1 inch button badge has 'I A Big Deal In The 80's' written in purple font. This is a badge for those people who loved the 80's, that was your decade. Was music, fashion and the owrld a better place in the 1980s. This is a cute badge to add to any 80s themed fancy dress party or indeed a stag / hen celebration. Here at Koolbadges HQ we have a soft spot for all things 80's.